Venice is an incredibly pretty city, one of those places everybody should visit at least once in life. With more than 30 million tourists per year, the question is not what to see but where to eat in Venice? We visited Venice the second time. And this time we wanted to discover all the places where to eat in Venice on a budget. 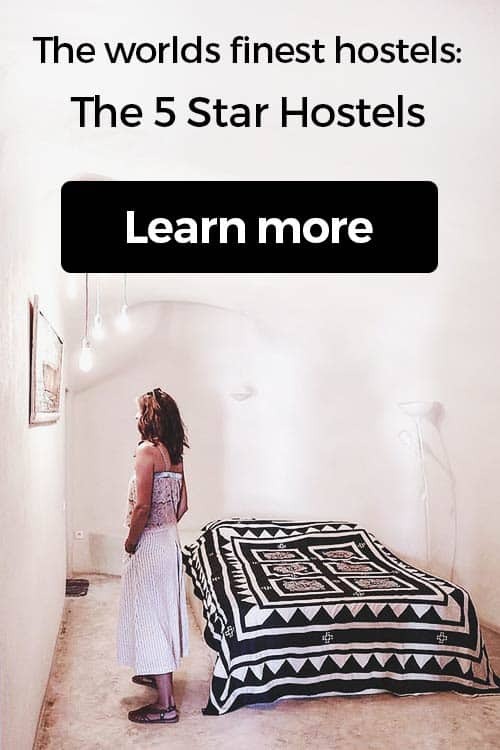 While visiting the 5 Star Hostel We Crociferi, we sat down with the team. The hostel staff knows its city like no-one else. We asked the staff and the locals about tips, tricks, and places to eat in Venice and now we want to share this information with you. 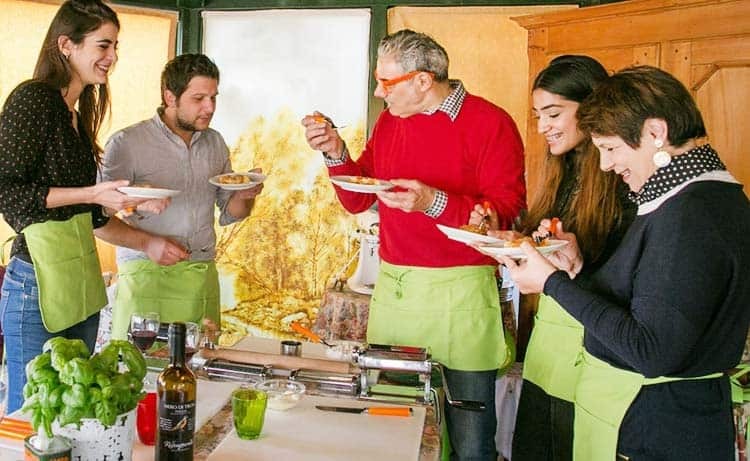 We also include the best food tours. 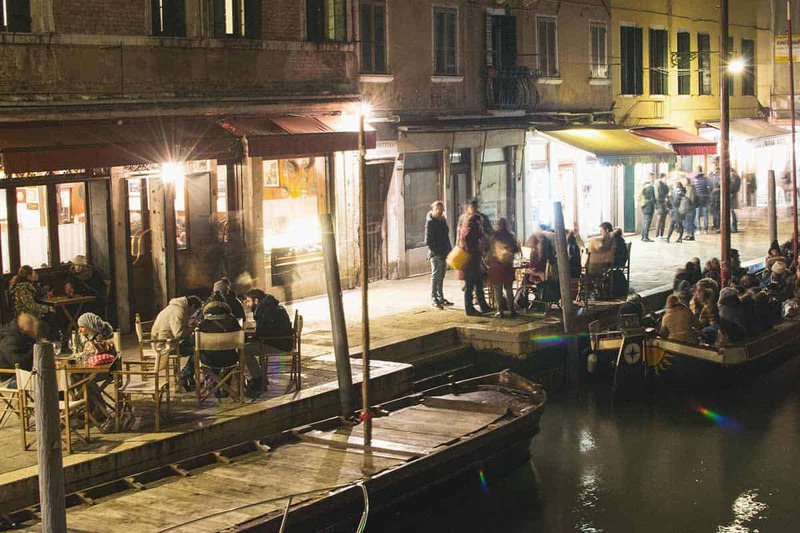 Before we start with the places to eat in Venice, we would love to introduce you first to the Venice food scene. Also, reading the Lonely Planet for Venice can be helpful. Venice is a touristy city. It receives more than 30 million tourist per year. That’s no surprise so far. 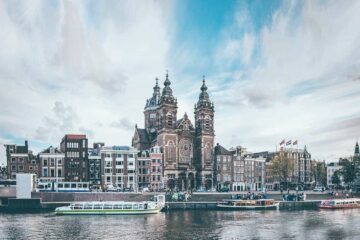 Tourist come from all around the world to contemplate the beautiful canals, as well as the old and preserved architecture. The population of Venice has decreased 3 times in the last 15 years, that is why, there are no places exclusively for locals. There are always tourists! Tourist and locals mix in the city of Venice! It is also known, Venice is an expensive city. We asked the locals about an average cost menu and they told us it would be around 35€. 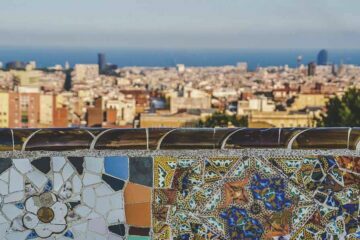 But we can show you how to spend less money, and get good quality food in this touristic but incredible gorgeous city. We wanted to hunt down the best pasta in Venice and all the places to eat in Venice on a budget. When we say “on a budget in Venice”, it still means it won’t be as cheap as Bologna for instance. You want to read our basic tips for food in Venice carefully. 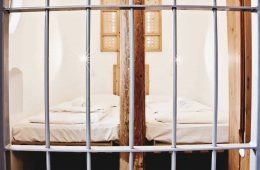 We will walk you through additional charges and things to consider before ordering, maybe even before sitting down. If you share the Antipasti. The menu cost will be reduced to 20-25€. Be careful about additional expenses. Most restaurants in Venice have a service charge. This is called “coperto“. This charge should be indicated on their menu. Normally it is around 2€. It can be already included, or it can even go up to a 14€ coperto charge in some hotels. So, keep an eye on this! Always, always ask about the “Coperto” charge before ordering the food. Furthermore, pay also attention to any other additional charges. Some places have a low coperto charge, but they do add 10% tax on the bill. Ask also about this issue before ordering in order to avoid any surprises. Even though Venice is an expensive city, there are plenty of options! You can also eat for around 12€, sitting in a restaurant, we are including these places on the list. Interesting fact: Nowadays many restaurants are run by foreigners. Select the ones run by locals to get the real Venetian taste. Pizza al volo means take away pizza. You can find cheap pizzas if you do not mind not having a seat. Just take it and find a seat outdoors. Be careful with pigeons and please always, always take your trash with you until you can throw it into a bin. This is similar to take away pizza, but it is a slice of pizza instead a whole pizza. 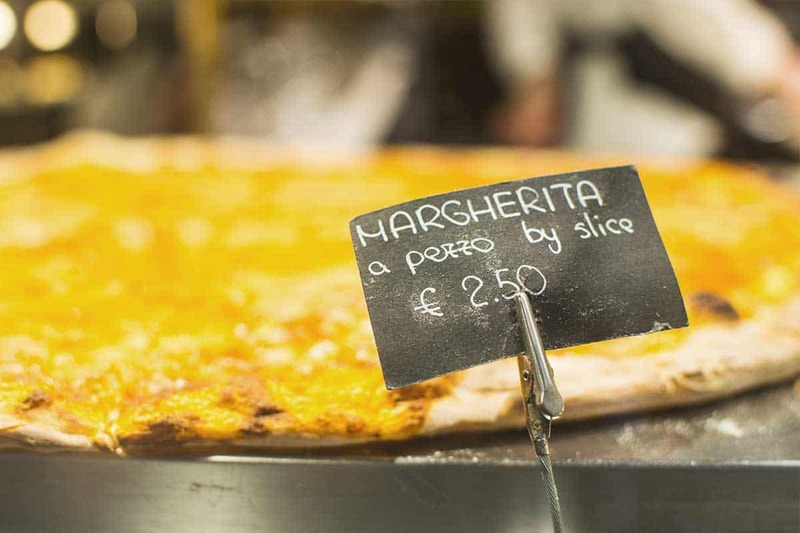 Don’t be fooled, some places have surprising expensive pizza prices like 10€ for a slice. Adding 5€ you can have a seat in a nice restaurant. Cichetti are known as the Venetian tapas, cichetti are cheap. It will cost you around 2€ per piece, and they have many places with a vary selection. Bear in mind you will need more than one to satisfy your stomach. For the savvy backpackers, there is always the supermarket option. When staying at WE Crociferi Hostel, you can use their kitchen and cook up your own meals. 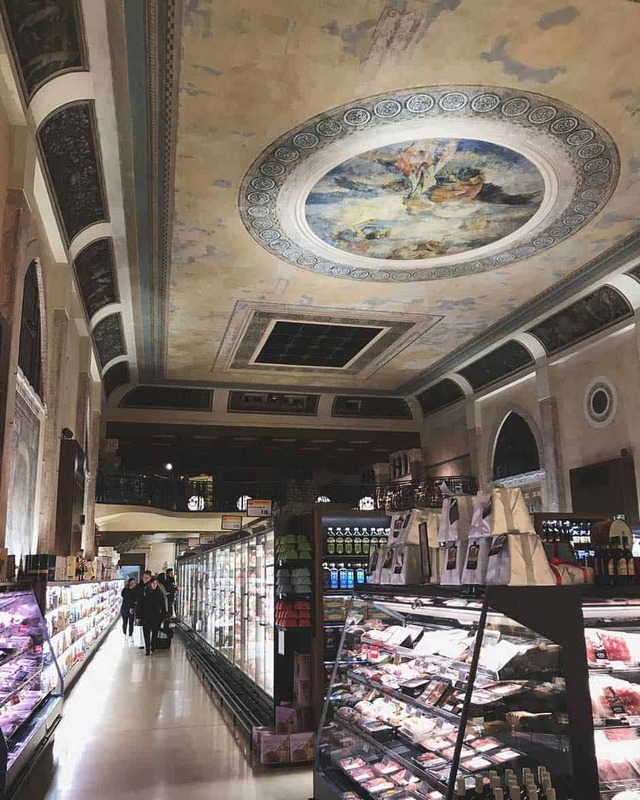 Did you know Venice has the most beautiful supermarket in the world? Can I have a picnic in Venice? Officially, it is illegal to hang out in the street or in public parks while eating in Venice. don’t drag out a picnic setting (blanket, basket…). Just eat your sandwich/ pizza as a local might do. 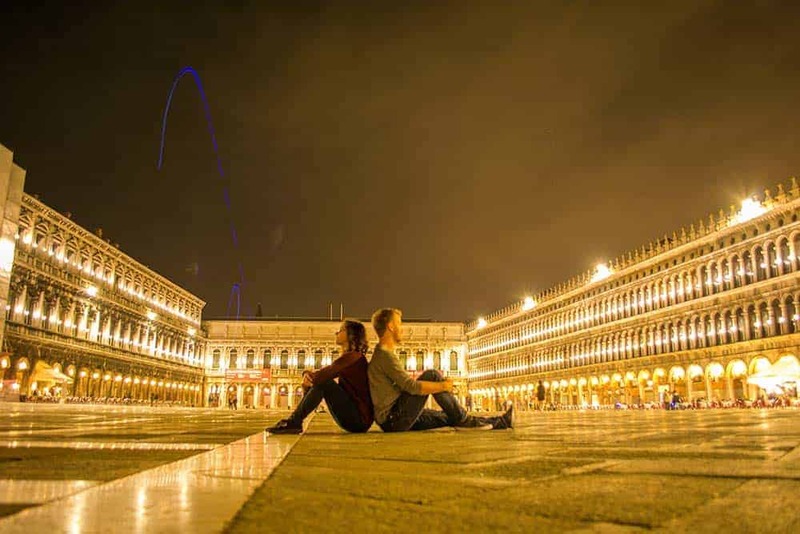 Okay…in the middle of the night you can sit down at Piazza San Marco and take some lovely photos. See below! 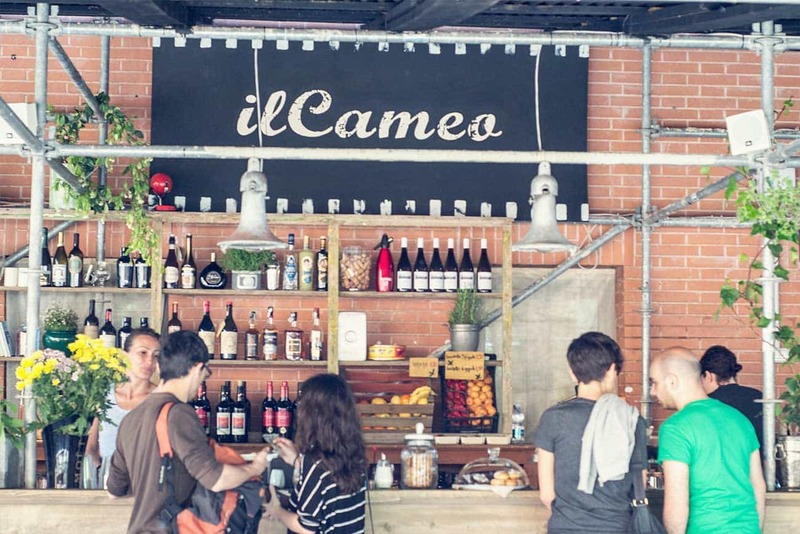 So, foodies and Venice lovers, here is our big list about where to eat in Venice on a budget. We will name 22 places to eat in Venice on a budget. At the end of the article we put all restaurants on a map. 1. A cozy Osteria – our top choice! Osteria alla Staffa is a cozy restaurant. 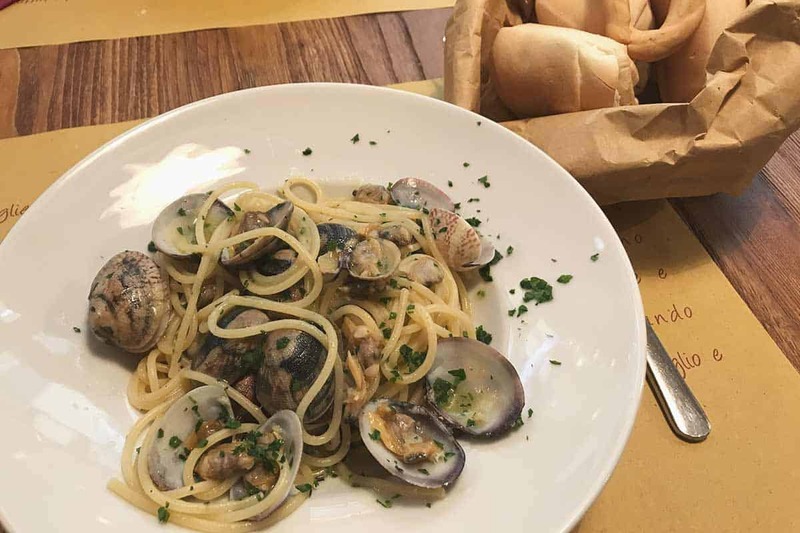 Spaghetthi vongole (with clams) are just 13€. The ambience is nice, as it is a little restaurant. Bear in mind they do have a 2€ coperto charge. But, you already know that you have to pay attention to this when you read our basics to eating out in Venice. Pasticeria Puppa, is a tiny bar owned by Massud, a great place near WE Crociferi Hostel. This is the best value for money we found in Venice. 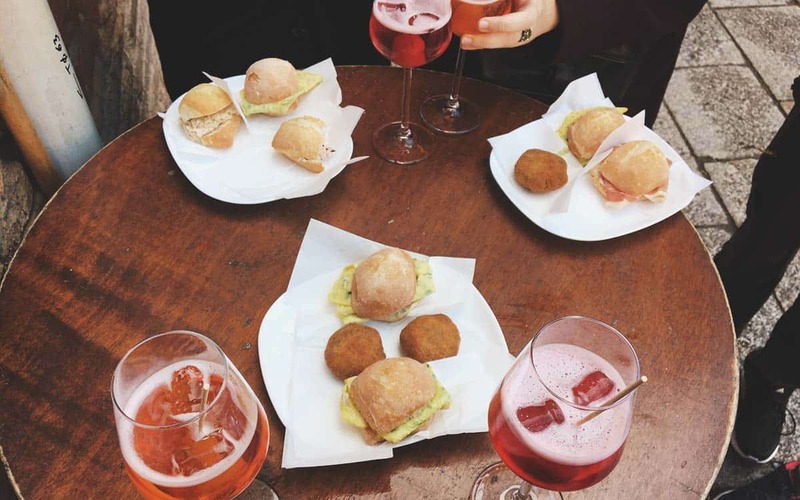 You will find many locals on the street during the aperitivo time with a spritz on their hand. The best part? They do also offer dishes, actually great food and big portions. Good food and big portions, go for it! We tried their home made Spaghetti Vongole and loved them! 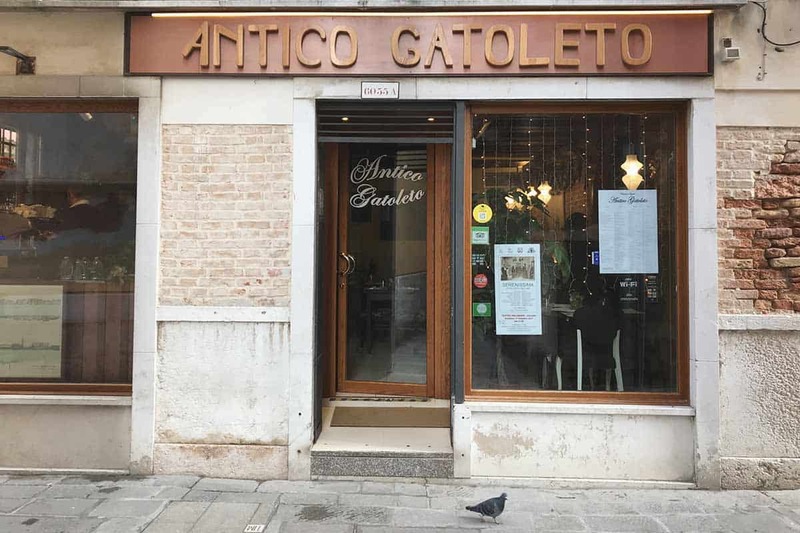 This restaurant is included in our Guide for Venice, which you can download for free. Antica Adelaide does not offer typical Venetian dishes. They do use local ingredients and try to do something new. They add a little twist to the local cuisine. Also, the restaurant owner is known as the personalized Venetian Wikipedia. If you happen to meet him, try to have a chat with him. 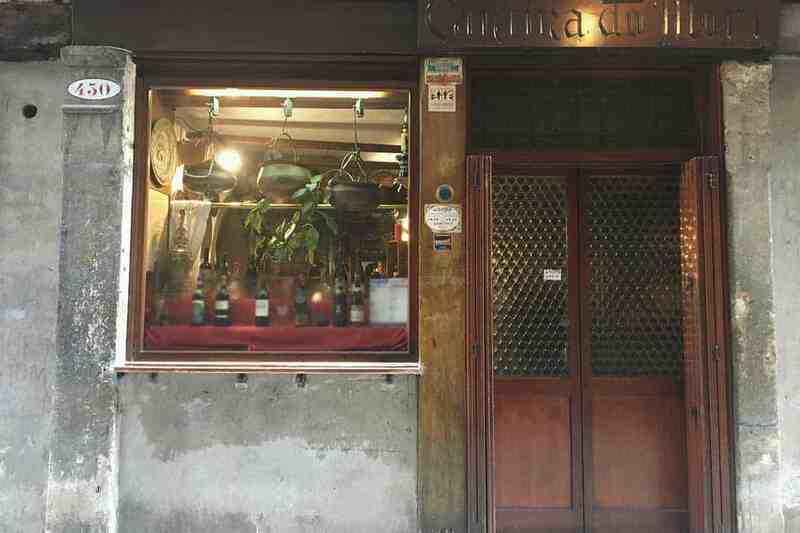 Cantina do Mori is known as one of the oldest bars in Venice. This eatery combines history, atmosphere, wines and good food. You can get a pasta dish for 12-13€. Now, you know that this is considered cheap in Venice. Al Timon is one of the trendiest place for the younger crowd. 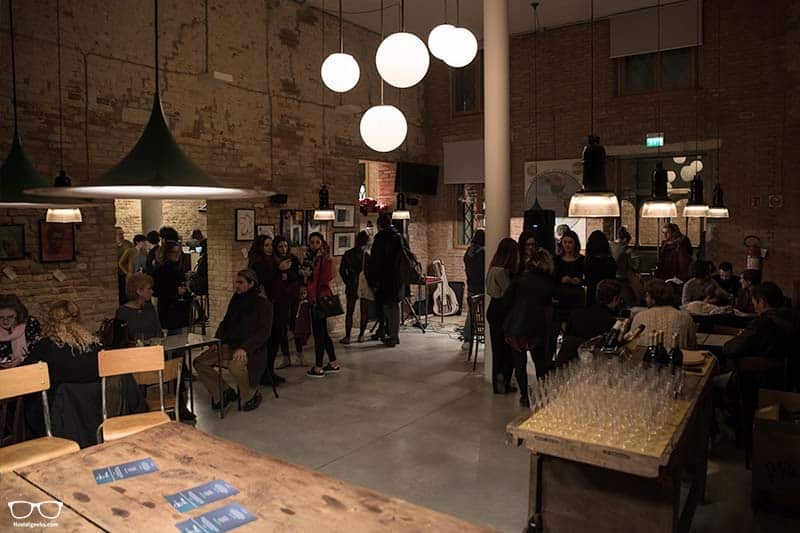 It is a bar offering great Cichetti and cheap Spritz, as well as big dishes. Order yourself a drink a the bar and take it outside to enjoy the Venetian aperitivo with the locals. Outside, you will find a boat, no two boats! You are welcome to sit there and savor your drink. If you want to eat there, make sure you have a reservation. FYI: this place and street is our favorite place for a night out and a drink. Further up the same street as Al Timon, you find Paradiso Perduto; the forgotten paradise! The locals certainly did not forget about this restaurant. We tried to go to Paradiso perduto on a Saturday night and it was impossible to get a seat. They were fully booked with big groups of friends. It is the place young people start their night out. They have dinner here and then they go out for a few more drinks. 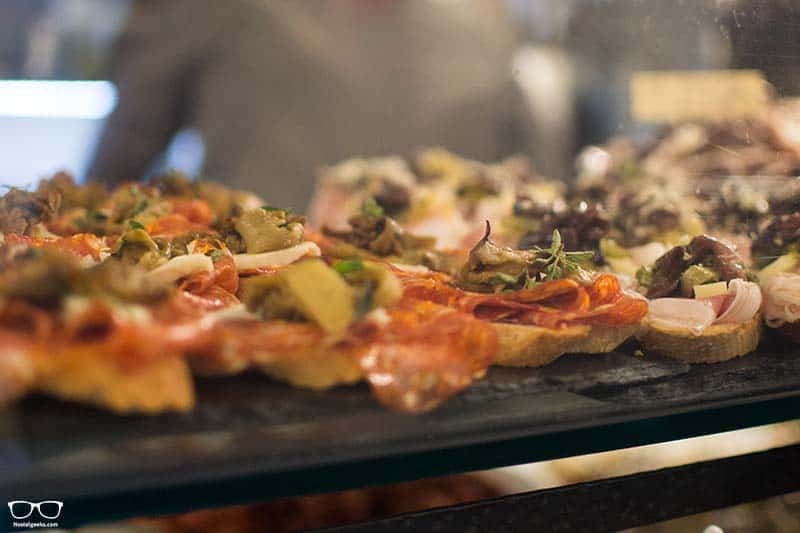 Have some Cichetti and wine standing up and then move to any other restaurant on the same street. Or even better: book a table in advance. Now you know – we didn’t! 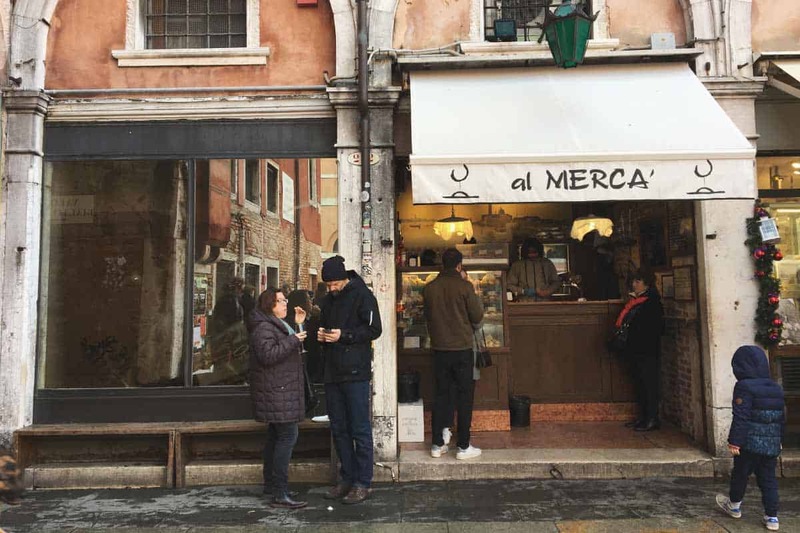 Al Merca is one of the most known places for traditional Cichetti in Venice. 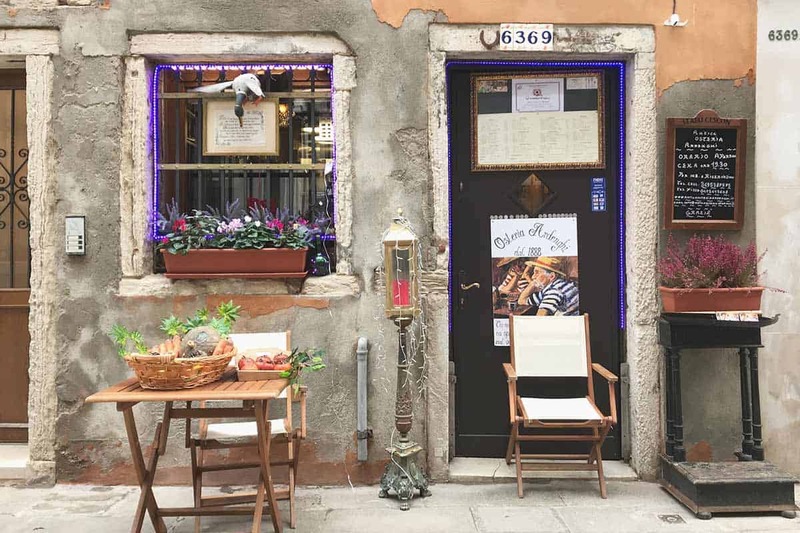 Al Merce is located right next to the famous Rialto Bridge. Tasty, good quality chichetti and great location. They do offer also good wines. Known for their wine selection, Vino Vero do also offer good Tapas (you know, the so-called Cicchetti). Ask for a wine, and select the Cicchettis you wish on the display bar. You can order more Cicchetti there or move to another place. 9. Join a Food tour – like we did! 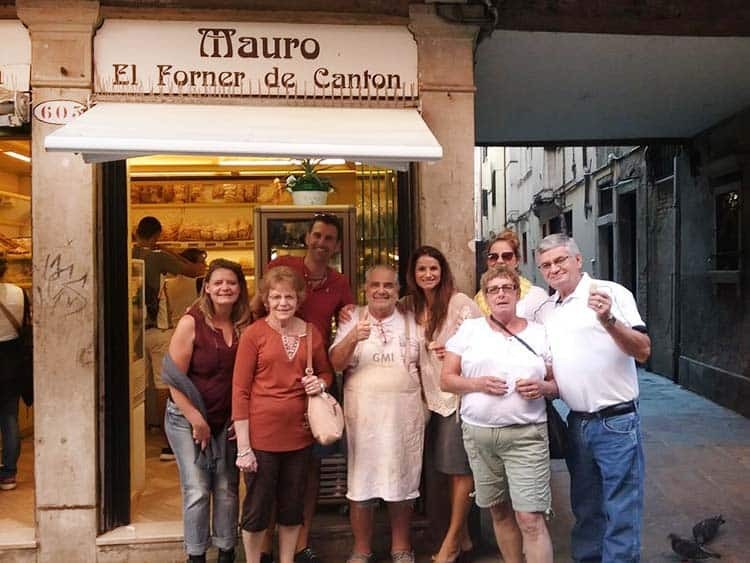 If you want to make sure you experience all the traditional Venetian food, then we recommend joining a food tour. Cichetti, spritz, Fritti, Spaguetti Sepia Nera, wine, and even after meal Italian coffee. If you have only 1 or 2 days in Venice, go for it. Also, I think it is the best way to actually start your Venice trip. The tour starts in the morning. The Food tour by Walks Of Italy covers everything you need to know about Venice, the food and culture. We joined this Local Food Tour and were captivated by the Venetian cuisine. We found also another Food tour which includes a Gondola ride. 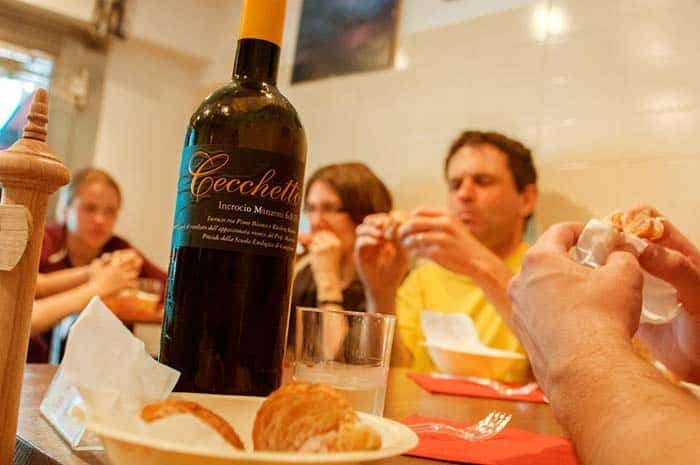 Check out our recommendations for food tours in Venice. One of the best Spritz we had during our stay in Venice was at the bar of the unique 5 Star Hostel in Venice We Crociferi. Ok, Spritz is not food, but it is a must try when in Venice. And it was delicious. You can also eat here at the WE Crociferi bar. They offer super yummy Panini and a few more dishes. Go into the old-former monastery, pass the square and order a Spritz at the bar counter. Fun Fact: A single Panini is actually called “panino”. Panini is the plural form. Far away from the tourist area, you will find Morion. What’s that, you ask? It’s a cultural hub! Even though it is most known for their nightlife and parties, they do organize also concerts, dinners, and local debates. This Osteria is one of the places which opens until late. Many restaurants in Venice won’t seat a table after 21:30. If you don’t make it to the restaurant, go to Osteria dal Riccio Peoco. 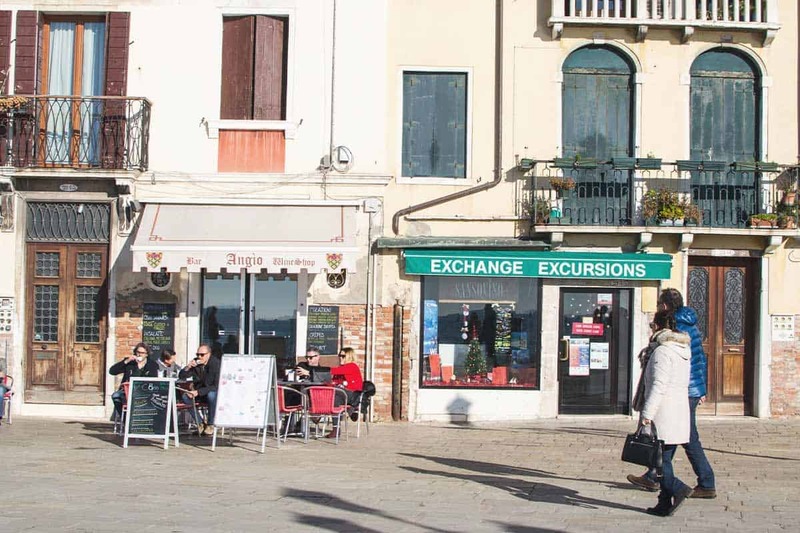 They serve typical Venetian dishes for a reasonable price – everything between 12€ and 25€. Jazz Club 900 is a place to listen to some jazz music and eat pizza near the Rialto Bridge. Jazz Club Novecento 900 is small and cozy, and its interior is full of old pianos and other musical instruments. Organic food hidden off Campo SS Apostoli. 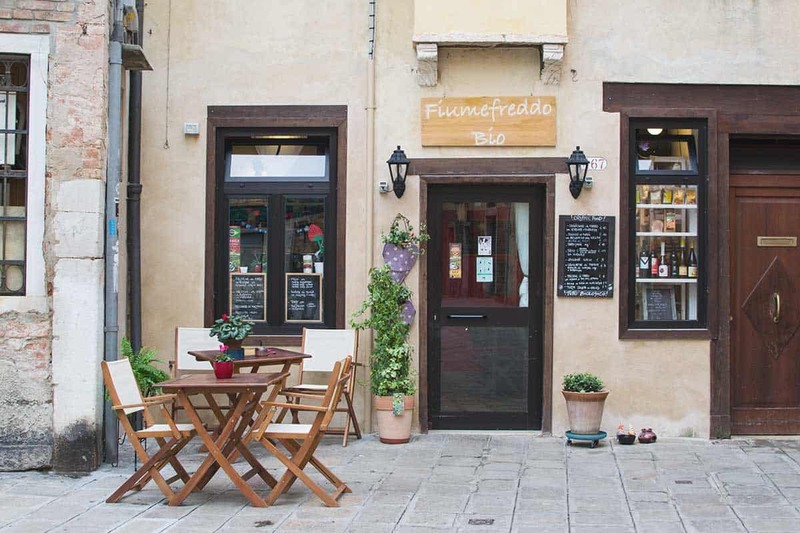 Fiumefreddo is a hidden gem with creative dishes and beautiful presentations. They take the typical local cuisine and turn them into a piece of art with biological, local, Zero km ingredients. Fancy some pizza? Then go to Pizzeria la Perla. 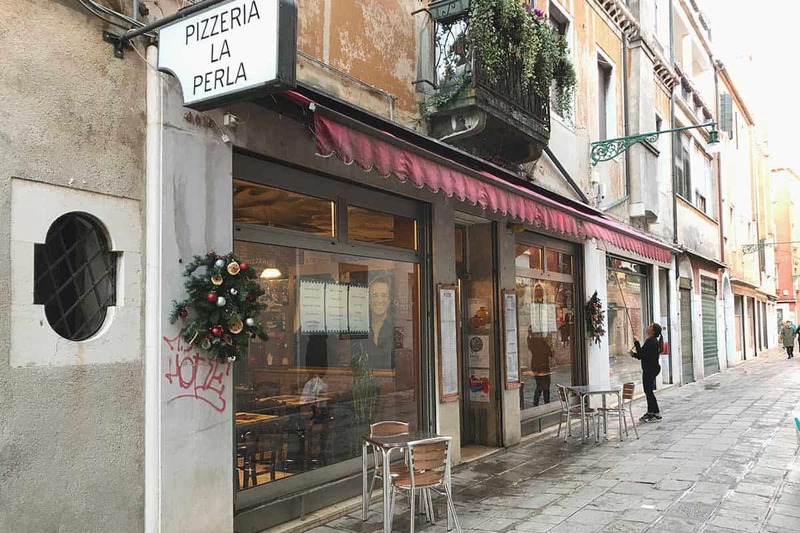 Pizza La Perla is considered one of the best pizza places in Venice. It is just in front of a cinema, so maybe have a look on a movie after dinner? Anyway, make sure you go before the movie ends to avoid crowds. Good to know: You can eat really well in Venice. However, Italians don’t consider Venice as a place to eat the best Pizza. 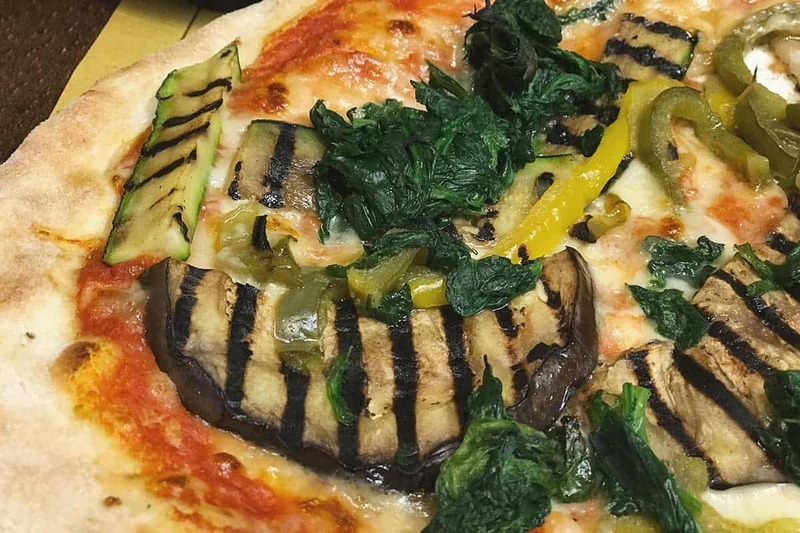 The best Pizza in Italy comes from Naples, it’s said. Now, this is Matt’s favorite restaurant. Located in one of the main streets you find Trattoria da Gigio. We would have not gone if the staff of We Crocifieri Hostel wouldn’t have recommend it, cause it is on one main street. This, you may assume, won’t be a good restaurant. We loved the food, as well as the place. The waiters were really kind in Trattoria da Gigio, and they also speak English. This will help in case you don’t speak Italian. 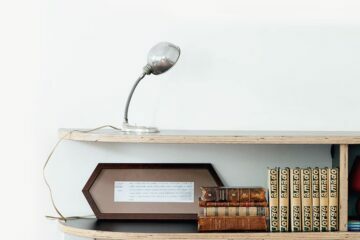 We give you a trick at the end of this list to assure the best customer service in Venice. A cozy traditional restaurant which only opens for dinner. Make sure you make a reservation, as Antica Osteria Ardenghi is tiny and popular among locals. Fun fact about this restaurant: It was once a really shady place. Only bad fellow were found here. The window on the left was always closed, and you could only see through the tiny window in the door. So, turn into a gangster and come here for dinner! If you are going 3 nights to Venice you might consider visiting another island. 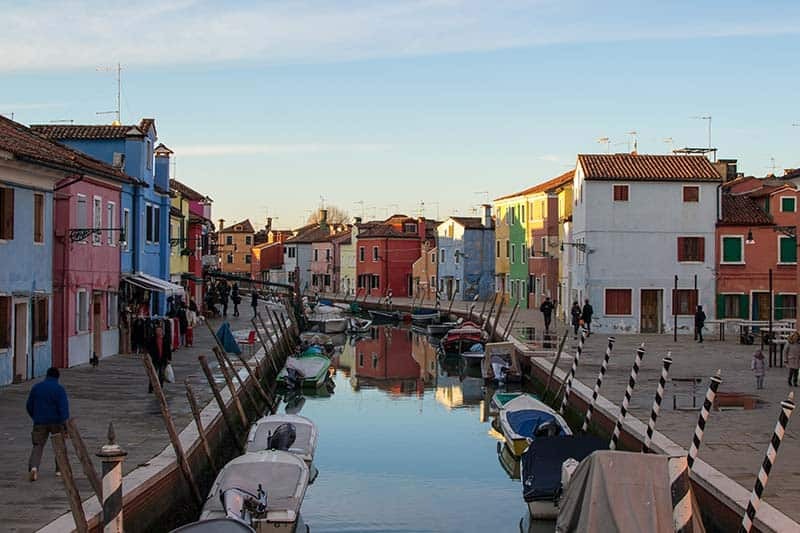 Burano is a tiny and colorful island around 45 minutes from Venice by boat. The boat to Burano just leaves around the corner of WE Crociferi. If you happen to be there during lunch or dinner, go to Al Gatto Nero. It’s the best place on the tiny island here. This restaurant is the most expensive restaurant on this list. 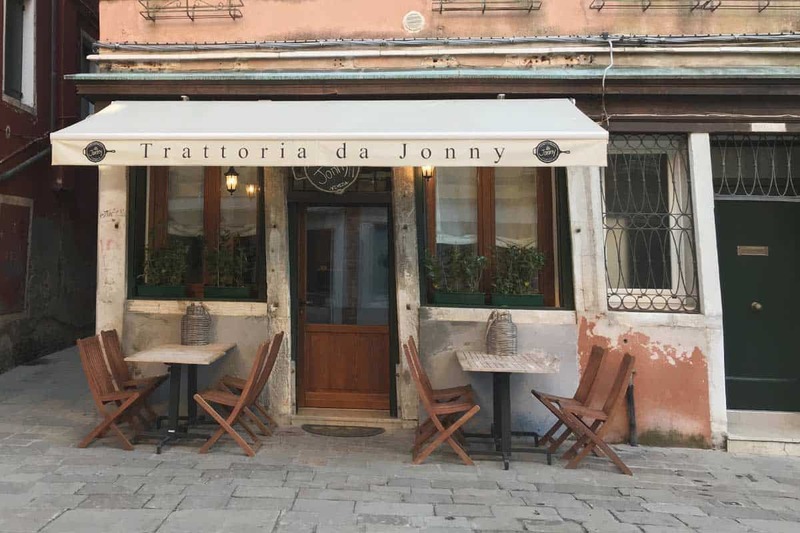 Trattoria da Jonny is a bit pricey. But food is prepared with attention to the detail. 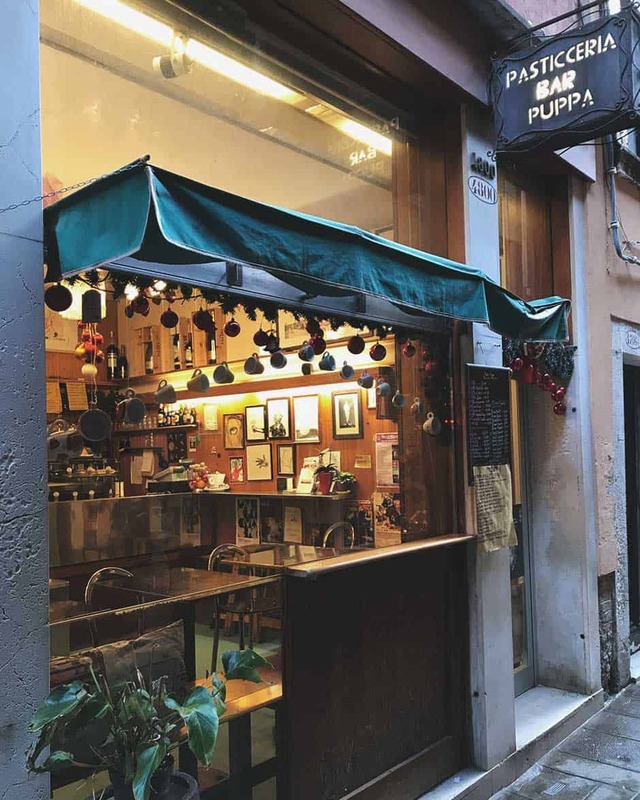 Their specialty is Spaghetti seppia nera, a traditional Venetian dish. We ate here and it’s really worth it to spend a few more EURs. Give it a try! With a lovely view over Venice water front, Angio is known as a Wine Bar. The food is good, they do offer also gluten-free pizza. We would recommend having a wine here. Ask for local wine from the region. What about Ice-cream? 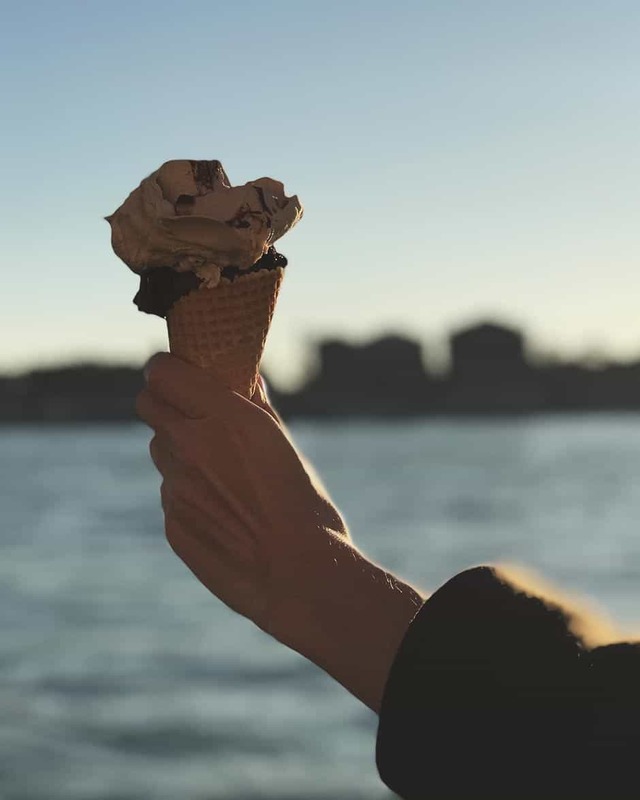 There are plenty of options around Venice for ice cream. One of the best ones is Gelateria Nico, which comes with a great view over Giudecca (an island in front of Venice). Take your ice cream and enjoy some people watching. 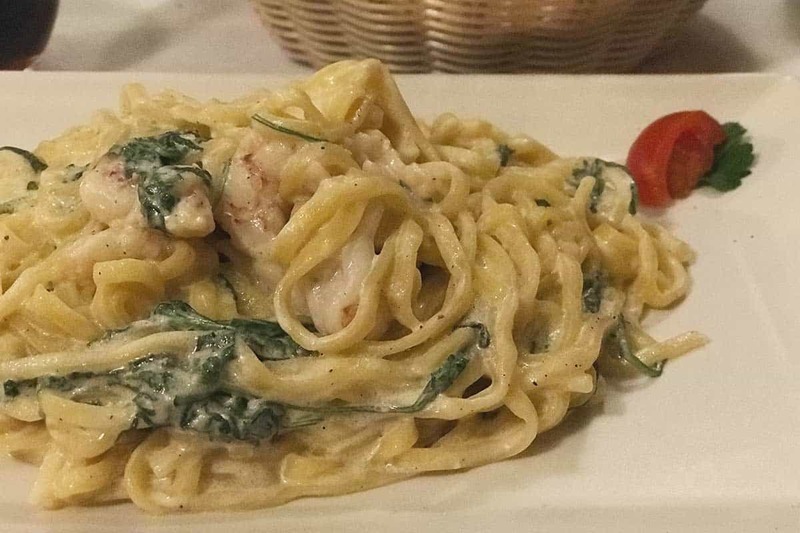 Located in a quiet area, Antico Gatoleto offers a Pasta dish of the day at an affordable price. It has an old style interior. Venice and food, yes that works. Therefore, doing an activity with food involved is something I really recommend. This is the tour we joined. FUN and very educational!! 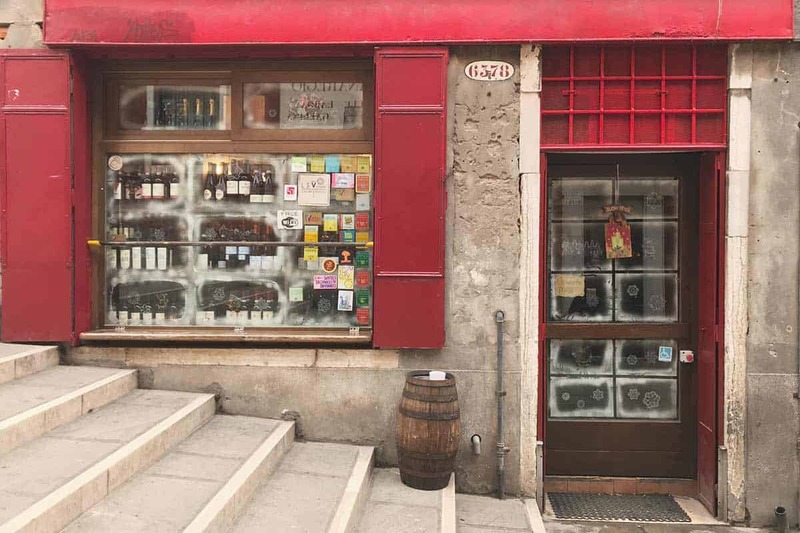 Take your tastebuds on a delicious adventure with this guided tour of Venice’s bacari wine bars and their famous cicchetti dishes. These small tapas-style dishes are ideal for pairing with Italian wine. Tour the city’s famous bars and dine like a local. 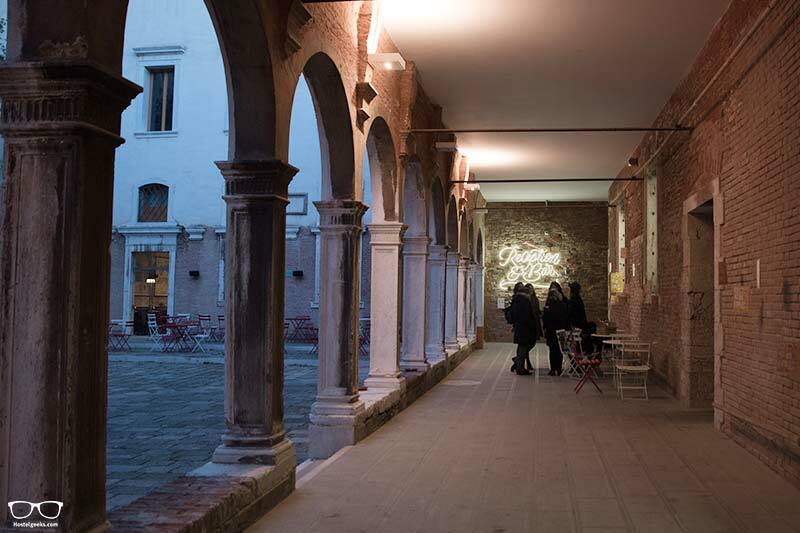 What about discovering the Venetian way of enjoying food together with a local? And even a gondola ride. All the details at point 9. Experience Venice like a local or tourist, without emptying your wallet, and enjoy a Venetian coffee or typical aperitif on the stunning St. Mark’s Square. Go to the historic “Al Todaro” bar, where you can sit on the beautiful terrace overlooking the square and island of San Giorgio. 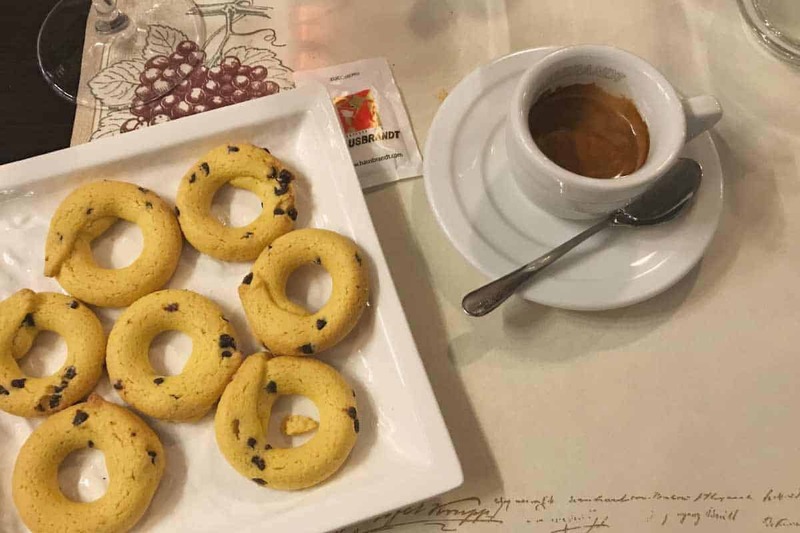 Order a typical Venetian coffee or cappuccino, or try a glass of milk served with biscuits. 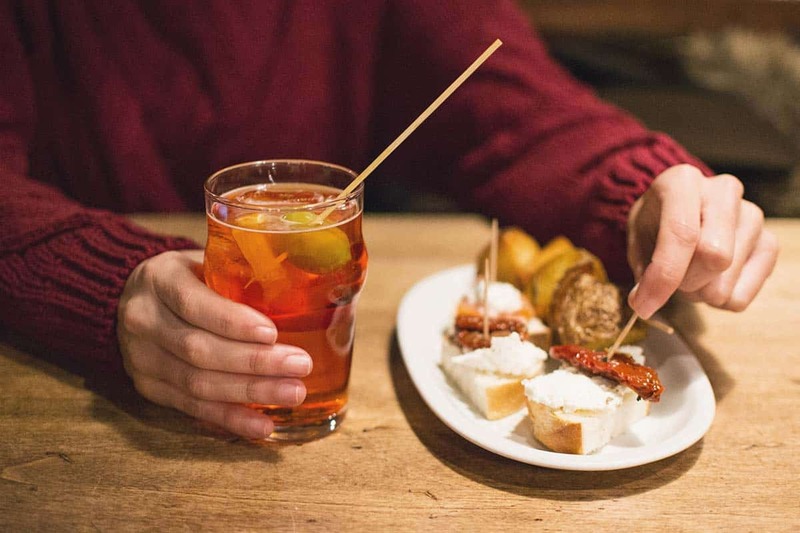 Alternatively, order the authentic Venetian aperitif known as a “spritz.” If you prefer, you can drink a glass of wine or soft drink (all served with crisps). 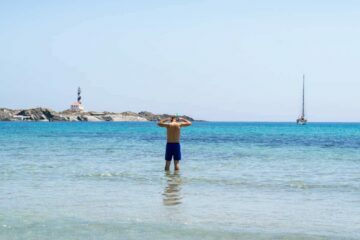 This is the CHEAPEST tour, it is only 11€! 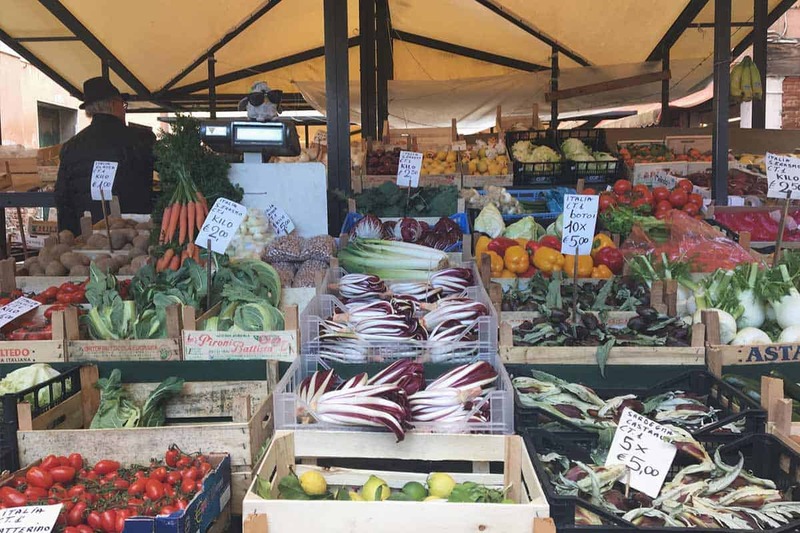 Experience one of the most vibrant sites in Venice on a tour of Rialto Market with a friendly chef. Select seasonal ingredients to prepare and cook an authentic Italian meal. Learn the history of the market and the story of the food produce before going to a typical Venetian palazzo for a hands-on cooking class. Prepare a starter, main dish and a dessert to enjoy at the end of your class. Benefit from a wine tasting session with a sommelier and experience some of the finest wines to pair with your food. This tour is recommended for families, elder and retired travelers. It is a very educational tour with a very lovely guide. Along the way, taste a wide range of food specialties, from regional cheeses to buranelli biscuits and traditional cakes. 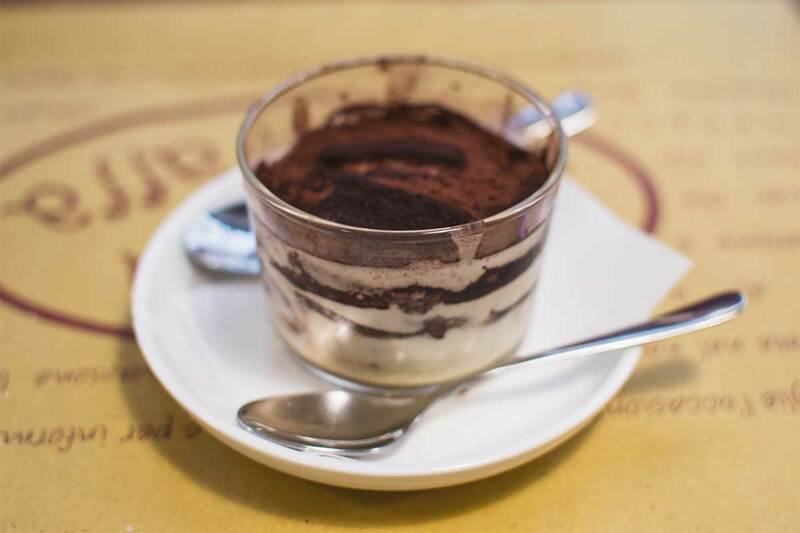 Sample some sweet tiramisù in the city where it was invented, and experience the unique culture of cicchetti, the tapas-like snacks loved by Venetians served in typically cozy bàcari. We asked also, what would be the must eat food in Venice. Tricks for where to eat in Venice? As Venice is a touristy place, our local friends gave us a great tip to receive the best service when going to a restaurant. The best trick would be going with a Venetian, but there only a few and usually quite busy, so… What could you do? Well, ask your accommodation to book the restaurant for you. If the restaurant knows that you have been sent from a local person, they will try their best to satisfy you. 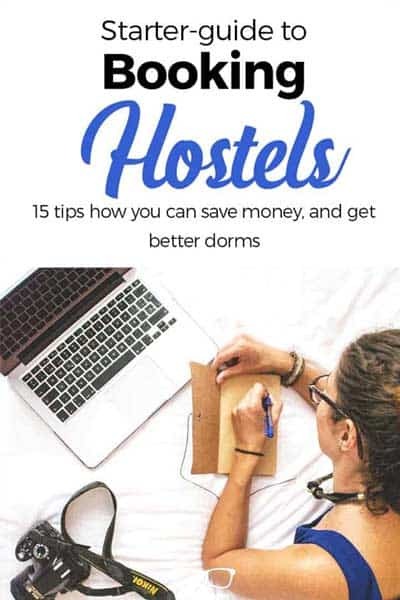 They do want that the hostel/ hotel keeps recommending them to the next guests. 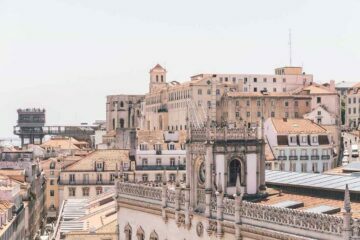 Besides immersing the food culture, you HAVE to visit the Basilica and Doge’s Palace. This is the absolute must-visit. However, there is usually along queue. I recommend taking the St. Mark’s Basilica & Doge’s Palace Tour with the guys from Walks of Italy. You will skip the line at St. Mark’s Basilica and also skip the Line Doge’s Palace. This saves you around 2-3 hours waiting! 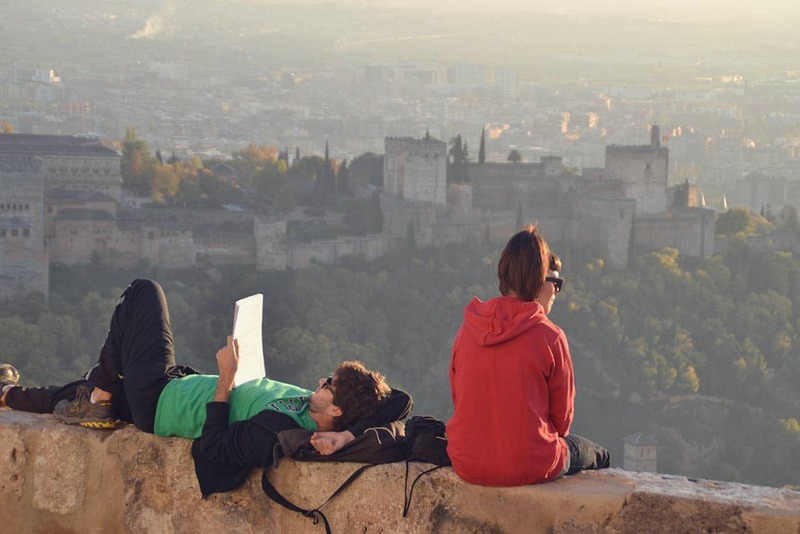 On top, you will have a fun, knowledgeable guide to take you around and share the secrets to the sights. Hope we clarified where you can eat next time you are in Venice. If we missed any restaurant you consider we should add, tell us. You can leave a comment below or simply send us an email. You should have a watering mouth right now. 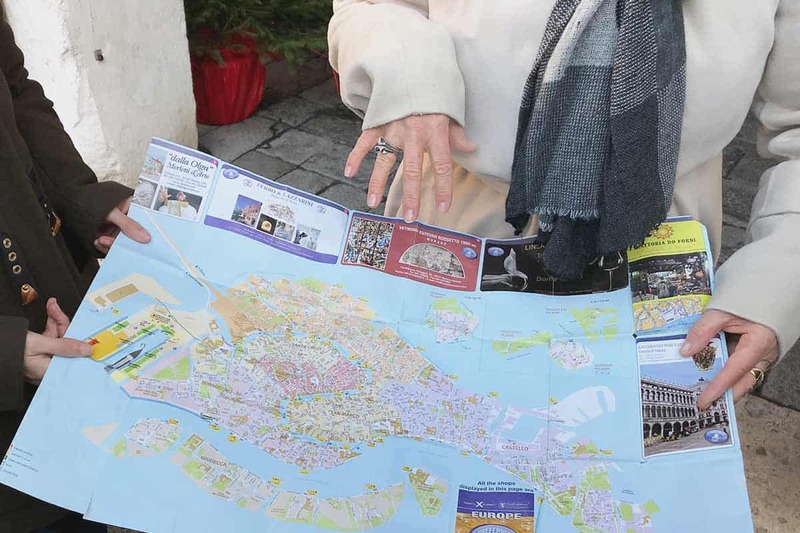 Then, go and start planning where to eat in Venice. Of course you can also pack the famous Lonely Planet. 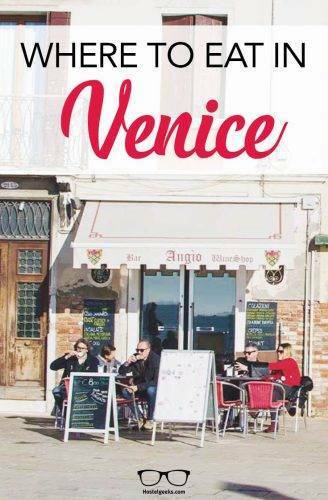 Here is the big guide book for Venice by Lonely Planet. We wrote also a secret guide for Venice. Get all the local tips, it is free to download! You don’t have a place to stay yet? 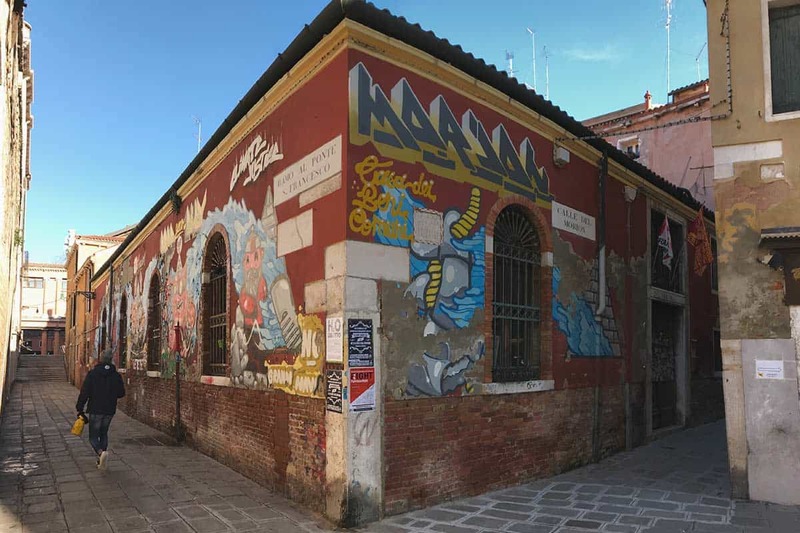 Check out our review of the unique 5 Star Hostel in Venice We Crocifieri and our guide to the best hostels in Venice. 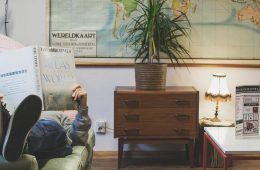 Staying with locals is more your style? 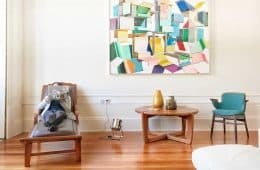 We got you 35€ off for your first Airbnb Experience.